In today’s increasingly competitive financial planning landscape, it’s becoming harder and harder for advisors to differentiate. Yet as the world of financial advisors gets more crowded, arguably the biggest problem is simply being seen in the first place. After all, if a prospective client doesn’t even know you exist, there’s never an opportunity to even try to differentiate yourself! In his recent book entitled “Platform”, author Michael Hyatt makes the case that the rise of the internet has created a unique new way to try to stand out from the crowd and be seen – not by trying to network and get referred to one potential new client at a time, but by building an entire “platform” that can showcase your expertise, and create opportunities for prospective clients to find their way to you. In other words, don’t just wait for referrals to come in (or ask for them); instead, build a platform that makes your expertise referable and attracts potential clients to you. Notably, though, the biggest caveat to building a successful financial advisor platform is simply to be certain it’s built upon a solid foundation in the first place. Which means owning your own domain name, the site itself, and all the content that’s on it – your digital real estate. And whatever you do, don’t just share your expertise on other websites – from LinkedIn Publishing to third-party Q&A sites – which ultimately just build the value of their platform, rather than your own! The simple reality of getting clients as a financial advisor – or really for any industry – is that in order to do business with someone, they first have to know that you exist. If they’re not aware of you, what you do, and the solution(s) that you provide, they’ll never know you were someone who could have solved their problems. For financial advisors, building awareness has typically been accomplished through referrals. It might be a particular client who refers a friend or family member, or a “center of influence” in the community who can refer a steady stream of prospective clients. Either way, awareness has been built primarily through networking, one person at a time. Yet the challenge is that in today’s increasingly crowded landscape, where more and more financial advisors are offering remarkably similar services to the same target clientele, it’s harder and harder just to get noticed amongst the crowd in the first place. 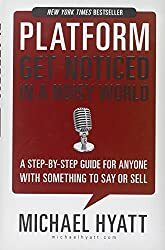 In his recent book, “Platform: Get Noticed In A Noisy World”, author Michael Hyatt makes the case that the best way to move past this challenge is to stop trying to network on the same crowded stage as everyone else, and instead build your own platform. As Hyatt notes, the point is not about elevating your ego and being the center of attention; it’s simply about finding a way to communicate that you have something of value to share with others, and giving them the opportunity to find their way to you. And fortunately, in today’s digital world, it’s never been more feasible for the average advisor to build their own platform, where digital “real estate” is far cheaper than physical real estate, Google has a far wider reach than the Yellow Pages ever did, and social media makes it possible to engage with and build a network far larger than could ever be accomplished in a traditional networking setting anyway. Unfortunately, though, as financial advisors we are not well trained in marketing in general, and certainly not in “platforming” in particular. Fortunately, Hyatt’s book is one of the most straightforward “How-To” guides there are for anyone who wants to start doing it for themselves. Historically, marketing has been something you did to the masses, and it requires a “platform” that could broadcast to the masses. Radio, television, and other traditional media channels were the leaders, and those who wanted exposure could earn their way onto those platforms… or more likely, pay to advertise on them. The good thing about traditional platforms has been their incredible reach, which leads to incredibly broad exposure. It’s no coincidence that Walter Cronkite, anchorman of the CBS Evening News from 1962 to 1981 (back when there were only a few networks that “everyone” watched), was recognized in a 1972 TIME poll as the “most trusted man in America” – it was because he had the largest platform from which he could broadcast his trustworthiness. In today’s world, media channels are more fractured and splintered than ever before, but fortunately the reality is that the typical financial advisor doesn’t need to reach “everyone” in America. Most financial advisors will have an incredibly successful advisory firm with no more than 75 to 125 highly engaged “A” clients (some with even fewer clients), and it’s not even clear that the typical human being can have more than about 150 “real” (financial planning) relationships. Which means it’s not even necessary to appear on a major broadcasting media channel. All it takes is building your own narrowcasting platform. What is narrowcasting? In essence, narrowcasting is nothing more than broadcasting a message or communicating something of value, but targeted to a narrow and specific audience (i.e., a niche market), rather than the mass market. Of course, the reality is that by broadcasting widely, you will eventually reach all the people you’re trying to reach with narrowcasting anyway… along with, perhaps, a few thousand or million others who didn’t want or need to hear the message, but got caught up in the broadcast anyway. The distinction, however, is that mass marketing through broadcast mediums like television, radio, or widely read consumer publications is expensive. The people who sell advertising don’t care that you only want to reach 0.1% of their readers. They’re going to charge you for reaching all of them. And in a world where it reportedly takes 7 contacts or marketing impressions with a prospect to really enter their consciousness, widespread broadcast marketing is difficult to repeat enough times to really have an impact (which, not surprisingly, is why so few financial advisors do broad-based advertising!). On the other hand, with narrowcasting, you don’t have to pay for or waste time reaching an audience that isn’t relevant anyway. Instead, the whole point is to only reach the audience that matters to you anyway – the group with whom you may someday do business, and to whom your message and value is most relevant, anyway. And in today’s world, the incredible opportunity is that anyone can build their own narrowcasting platform, without needing the resources of being a major broadcast media company! As Hyatt notes, the whole point of building a narrowcasting platform is to literally have a platform stage – or at least, a virtual stage – upon which you can stand to communicate your message. And in the digital world, the real estate upon which you can build is your financial advisor website. In other words, just as you have an advisory firm office that is the professional, credible base from which you deliver your financial planning advice, so too do you need a financial advisor website to form the professional, credible platform from which you can market your financial planning services. After all, if you’re going to narrowcast valuable information to strangers to try to get them to come back again – and eventually become clients, and bring their friends too! – it’s necessary to have something worth them coming back to again and again! If you want website visitors to become clients, give them value worth coming back for again! – Professionally Designed Website. Your website is the base of your digital narrowcasting platform, and if you want to look like a credible professional, the website needs to be professionally designed. The best financial advisor websites include not only the structural essentials (e.g., proper navigation, a mobile-friendly responsive design, etc. ), but also visually convey your professionalism (i.e., a clean, modern design with visually appealing graphics and fonts). Just as you wouldn’t build your own office space by hand, you shouldn’t do your website yourself either, nor just use a pre-packaged template. For most of your prospective clients, your website will be their first impression, so make it a good one. – Professional photos. People connect with people by seeing them, which means it’s essential for you to have your picture, and pictures of your team members, up on your website. And if you want to convey the professionals of someone to whom clients should entrust their life savings, get real, professional headshot photos. Pictures of you from a family event with your significant other cropped out of the picture are not acceptable. Nor is having a photo so old and outdated that if someone saw your photo and then met you, they wouldn’t recognize you! – Have A Compelling “About [You]” Page. Because people connect with people first, most prospects who visit your website will go first to the “About [You]” page to learn more about who you are. Then, if they decide they “like” you, they will move on to read more about what you do. So tell your story on your About page, written in the first person, as though you’re talking with your prospective reader, to really connect with them. And be certain to note not just who you are, but who you’re trying to connect with, so that if the reader really is a prospect you want to read, your message will resonate! – Case Studies. Examples of the ways that you work with people, and how you helped to solve a problem. Hyatt advocates that you include outright testimonials here, but unfortunately since those aren’t permitted in the financial services industry, anonymous case study examples of what you did and the (non-investment-performance) results achieved are the best you can deliver here. – Have A Blog. As a financial advisor, the purpose of a blog is to demonstrate your knowledge and expertise, which both helps show a prospective client what you do and why he/she should work with you, and also becomes a reason for that prospect to keep coming back to your website for more (allowing you to drip market your expertise over time, until he/she is really ready to do business). A website without a blog is just a (mediocre) digital brochure, which doesn’t engage strangers who visit to become prospects or clients. A financial advisor website without a blog is just a (mediocre) digital brochure. Own Your Financial Advisor Website Platform – Don’t Be A Digital Sharecropper! The rise of social media, and a wide range of “web 2.0” new media platforms, means that there are more opportunities than ever for your content to be seen. You can create articles and videos on your own website, or on social media platforms like LinkedIn or YouTube, or even on “bona fide” new media websites like the Forbes or Huffington Post blogs. The more content these platforms get, the more visible they become, the bigger they grow, and the more visitors they attract to see that ever-growing volume of content, in a virtuous circle. The challenge, however, is that as someone who is trying to demonstrate expertise by sharing content on those platforms, your ultimate visibility and reach to people with whom you might do business is entirely in the hands of the people who control that platform. In a manner similar to many farmers in the aftermath of the Civil War, you may be able to eke out a living, but you’re really just a sharecropper tending someone else’s land (and allowing them to reap most of the profits for the value you create). In today’s world, an equivalent form of “digital sharecropping” has emerged, where an expert creates content to demonstrate their expertise but publishes it on someone else’s website where most of the economic benefits go to the platform, not the expert content creator. Or viewed another way, it’s like the saying: the wise man builds his house on a foundation of rock, while the foolish man builds a house on sand that could be washed away at any moment. When it comes to building your financial advisor platform, building on rock means actually buying your own piece of digital real estate to build upon, and owning what’s built on top (e.g., actually buying your own domain name, having it hosted by a reputable third-party platform, and using an open source content management system like WordPress to run it, with a theme you own the rights to). – AVOID: Not having your own blog and just posting all your content on third-party platforms like LinkedIn. Social media sites like LinkedIn have begun to aggressively market their platform as a place for financial advisors (and other professionals) to post all their content. The idea is that by using their large and well-trafficked platform, you can instantly get more exposure to all the people using the site. The problem is that people may see your content there, but you have no ability to convert those readers into people who will do business with you, because they’re not actually visiting your site where they can learn more about your services, they’re just seeing it on LinkedIn. The end result: posting all of your content to other websites builds the value of their digital equity, robbing you of the opportunity to make your valuable content build your platform! You also hold yourself hostage to the potentially changing terms on those third-party sites. For instance, what happens if the company suddenly declares that to continue to have your content be seen, now you’ll have to start paying for distribution (which is exactly what happened to those who built on Facebook years ago, and may potentially happen to those using LinkedIn in the coming years!). – AVOID: Participating in third-party Q&A sites. A similar problem to sharing all your expertise in the form of “blog” articles on other sites instead of your own, is participating in third-party “Q&A” sites that purport to give you “exposure” by answering consumer questions on their highly-trafficked sites. The problem here, once again, is that doing so feeds content to the other site, allowing them to build even more visitor traffic and increase the value of their website, but does nothing for your own platform. After all, when someone connects with your expertise on your platform, you have the opportunity to engage them further – inviting them to follow you on social media, sign up for your mailing list, or even contact you about doing business. When they engage you on someone else’s website, you have no way to extend the relationship further – because it’s not your website – which eliminates any possibility of actually doing business with them. Notably, the point here is not to only share your expertise on your own platform. Continuing the analogy of the platform-as-a-stage, sometimes it’s good to be seen on someone else’s stage where it creates an opportunity for those people to come back and see you on your stage in the future. In the world of blogging, this is called “Guest Posting” or “content syndication”, and could also include doing (selective) Q&A on other platforms, participating on podcasts or radio interviews, etc. But again, the key to building your platform – as Hyatt emphasizes so well in his book – is that in the end, all roads must lead back to your platform. Otherwise, you’re not really building the value of your platform, which is so necessary in today’s world to create that opportunity for people to find you, and come back, and form the relationship with you that leads them to eventually do business with you! So what do you think? Have you build your own financial advisor website platform to showcase your expertise and your services? Do you share your content and expertise on other platforms as well (e.g., LinkedIn Publishing, or various Q&A platforms)? What have your results been for content you create on your platform, versus others? Please share your thoughts in the comments below!